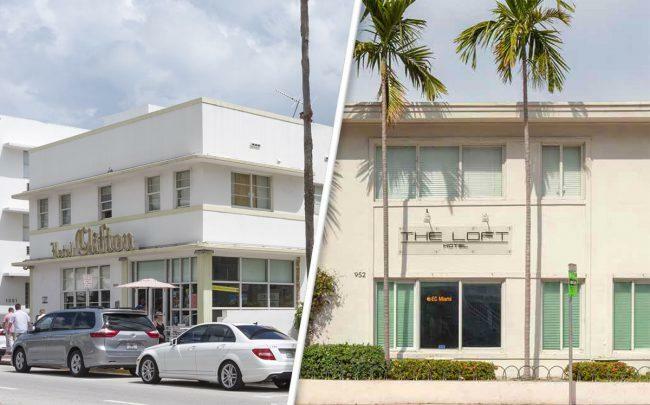 A Los Angeles real estate investment firm is looking to sell two boutique hotels in South Beach that could trade for more than $300,000 a key, according to a commercial broker. Hawkins Way Capital is listing the 35-room Clifton Hotel at 1343 Collins Avenue and the 22-room Loft Hotel at 952 Collins Avenue for sale with CBRE’s Natalie Castillo and Joshua Beene. At that price per room, the properties could sell for more than $17.1 million, according to Paul Weimer of CBRE. Both hotels could expand through additional floor area ratio, according to the listing. In January, the Miami Beach Historic Preservation Board approved plans for the Clifton Hotel, which call for a partial demolition and renovation of the existing building, the addition of another floor, and a variance to reduce the minimum size required for hotel rooms. The Loft property is zoned for mixed-use entertainment, which allows for an FAR of 2.0, or an additional 5,500 square feet of space, according to the listing. Property records show Hawkins Way Capital paid $8.8 million for the Clifton and $5.2 million for the Loft Hotel in 2014. The Clifton, built in 1948 and renovated in 2011, is LEED Gold certified and has rooftop solar panels. The building includes ground-floor retail space. The Loft was built in 1958 and features suites with full kitchens in each unit and a private courtyard. EC Miami, an international language school, has a master lease at the building until December 2019 with a projected net operating income of $450,000 for the year. A new owner could renew the lease, convert the property to a traditional hotel, multifamily units or co-living, according to the listing. An apartment building at 250 Collins Avenue sold about a year ago to a European investment and management firm with the option to convert the building into short-term rentals, a hotel or a condo-hotel. The sale price was $14.6 million, or more than $540,000 per apartment. Generator Hostels opened in a former Miami Beach condo building at 3120 Collins Avenue in Mid Beach last year after a major renovation.